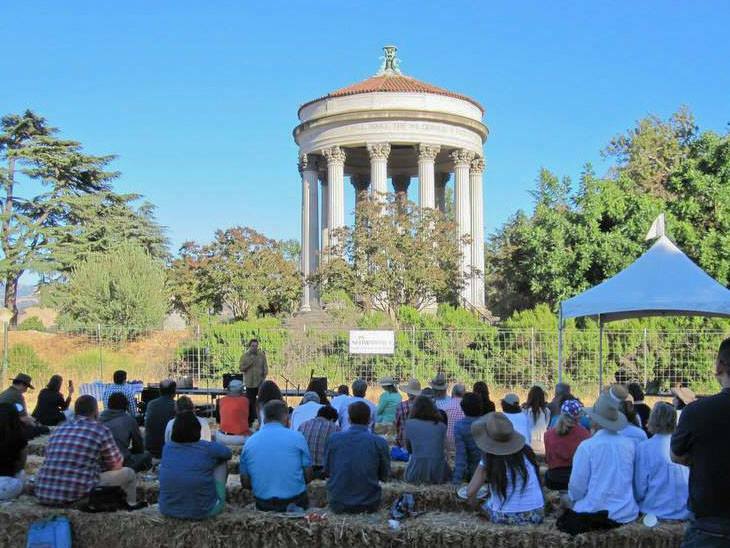 The Sunol Water Temple AgPark is a collaborative farm that provides land access and technical assistance for diverse beginning farmers, public education and natural resources stewardship. SAGE created the AgPark in 2006 through an historic partnership with the San Francisco Public Utilities Commission (SFPUC), the landowner. Part of 40,000 acres of Alameda Creek watershed lands owned by the SFPUC, the AgPark is located on 20 acres of prime farmland in the beautiful Sunol Valley. It is sited at the confluence of two wild creeks and adjacent to the 100-year-old Sunol Water Temple. Today the AgPark is a thriving urban-edge farm, home to eight small-scale organic farming enterprises that produce fresh food for local markets, and an annual field trip destination for thousands of school children, mainly from low-income communities. It also engages the local community through events, work days and volunteer and internship opportunities. The Sunol AgPark serves as a replicable model of the AgPark concept, which SAGE has been developing for over a decade. As part of its Fee-for-Service offerings, SAGE develops feasibility studies and business plans for AgParks on pubic and private land.